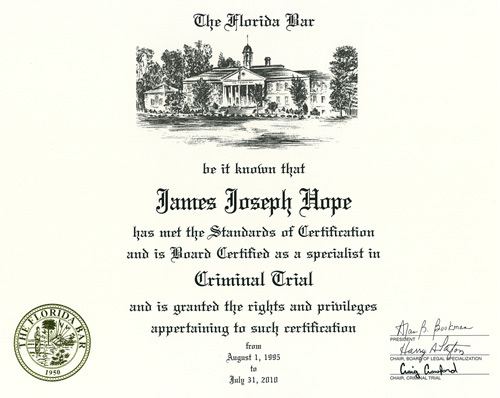 James Hope is Board Certified by the Florida Bar as a Criminal Trial Specialist, and has been practicing criminal law in Tavares, Florida, since 1987 -- over 28 years. 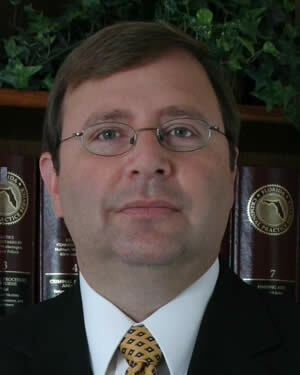 From 1987 to 1993 he served as a Assistant State Attorney (Prosecutor) in Lake County, developing experience in criminal matters at all stages of litigation and held supervisory responsibilities at the Juvenile, Misdemeanor, Felony and Capital Post-Conviction Relief levels. In fact he has fought more than triple the number of Felony Jury Trials required for initial Board Certification -- right here in Lake County. "Certification is the highest level of recognition given by the Florida Bar for competency and experience within an area of law." "In Florida, only board certified lawyers are permitted to refer to themselves as "experts" or "specialists". Board certified lawyers are legal experts dedicated to professional excellence who have met vigorous standards for experience and professionalism." Established in 1982 by the Supreme Court of Florida, Board Certification provides consumers with assurance in the selection of legal counsel. 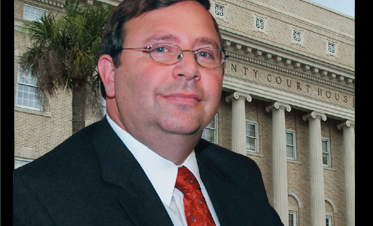 A lawyer who is Board Certified by The Florida Bar has demonstrated ability and experience in his or her field of practice and has earned a reputation for professionalism within the legal community. The Board Certification program operates according to Supreme Court approved standards in 20 practice areas. A member of The Florida Bar who has earned this career achievement may list "Board Certified" or "Specialist" or "Expert" on business cards or letterhead, in legal directories or in the yellow pages of telephone directories. The logo displayed on this page also signifies "Board Certification" and helps identify a lawyer's certification status.